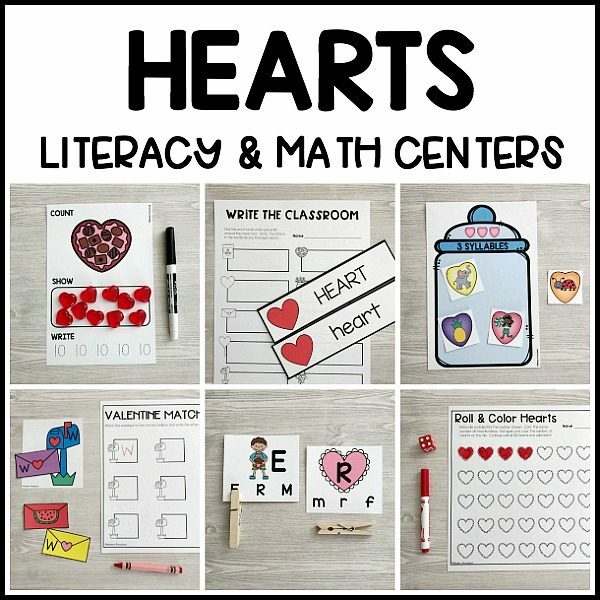 We are so in love with our HEARTS literacy & math centers for Valentine’s Day to use with your favorite preschool, pre-k, or kindergarten kids! 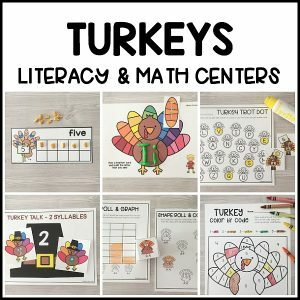 You class will swoon over these printable activities, and you will just LOVE how much of a time saver our centers are. 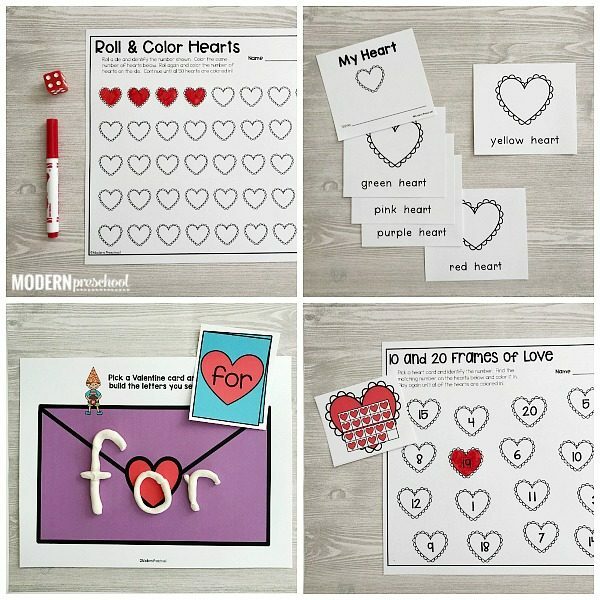 Print the Valentine’s Day themed, low prep literacy and math activities full of easy to follow directions. 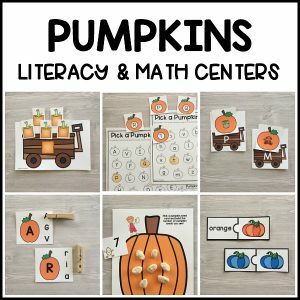 This makes the learning centers perfect for preschool, pre-k, and kindergarten. Use the additional and optional versions of activities to reach the different learning levels in your classroom. 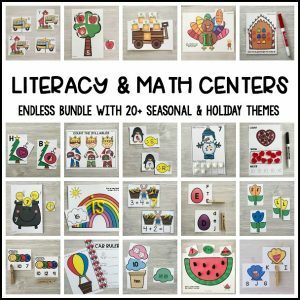 The HEARTS literacy & math centers are part of the ENDLESS Themed Literacy & Math Centers Bundle. It’s such a smart way to save big! Read about more than 13 HEARTS Literacy & Math Centers for Valentine’s Day in the descriptions below. Photos of the activities in action can be found above, including different versions of the printable learning centers. 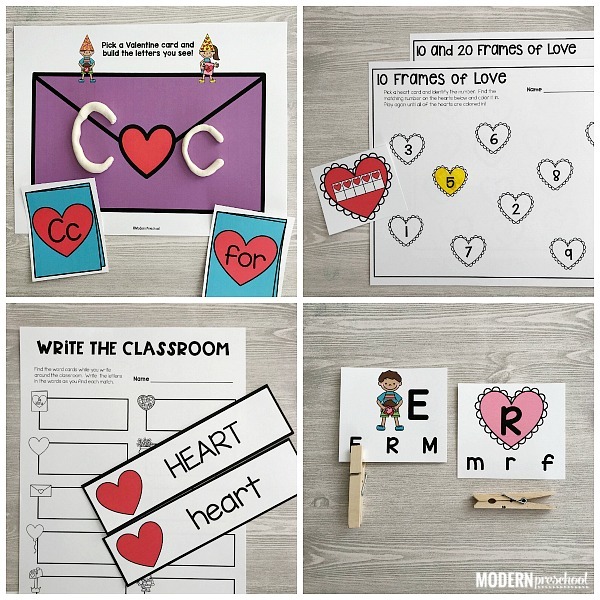 Hearts Vocab & Write the Room – 10 Valentine’s Day themed vocabulary word cards are included in both uppercase and lowercase versions. Use the cards in your writing area, during social studies, or along with circle time. There are 3 Write the Room recording papers (trace uppercase words, trace lowercase words, write the words on your own) and Color the Room recording sheets included to differentiate instruction. “My Hearts” – includes repetition, sight words, color words, and themed words. Includes 2 pages per piece of paper to make copying and assembling books super simple! “My Hearts” (mini) – 2 words per mini page with use of color words in the reader. In this mini book, the entire reader is printed on one page. Practice the simple themed words and color words with clues from the pictures. Hearts Alphabet Clip Cards – 2 versions included – Match the uppercase letter to the uppercase letter or match the uppercase letter to the lowercase letter with the 2 sets of clothespin clip cards. Use a clothespin or other themed marker to mark the correct match. 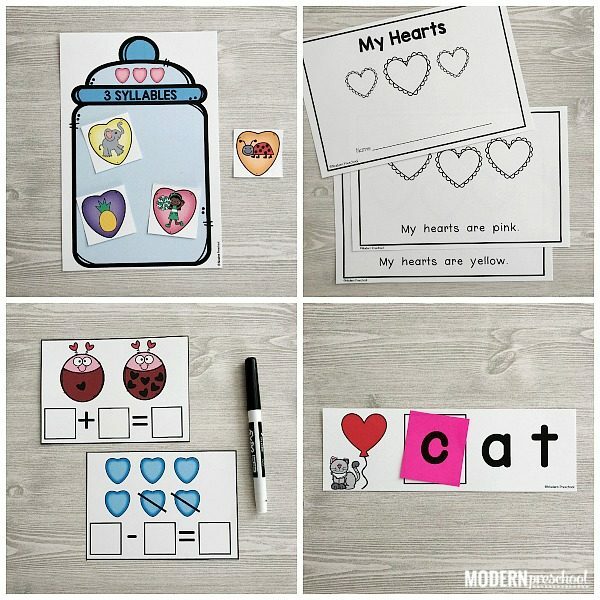 Initial Sound CVC Heart Cards – Practice beginning sounds with this set of CVC picture word cards. Identify the missing beginning sound and letter, add it to the word, sound out the word, and say it fast to introduce and practice blending. Valentine Alphabet & Sight Word Play Dough Mats – Create the letters on the card and the letters in the sight words on the Valentine envelope. All uppercase and lowercase letters are included as well as the first 50 words on the Fry 100 list. Valentine Alphabet & Initial Sound Match – So many ways to play are included! Match the uppercase, lowercase, or initial sounds in the pictures on the envelopes to the letter on the mailbox. 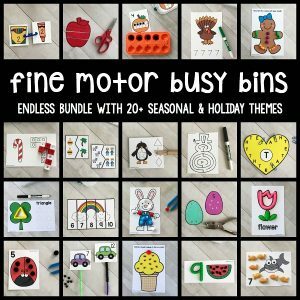 Easily differentiate the learning levels and use the recording sheet included to practice letter formation. Candy Hearts Syllable Sort – Use the images on the candy hearts to sort them correctly on to the candy jars. A 1 syllable, 2 syllables, and 3 syllables jars are included in the set alone with 4 candy hearts per jar. 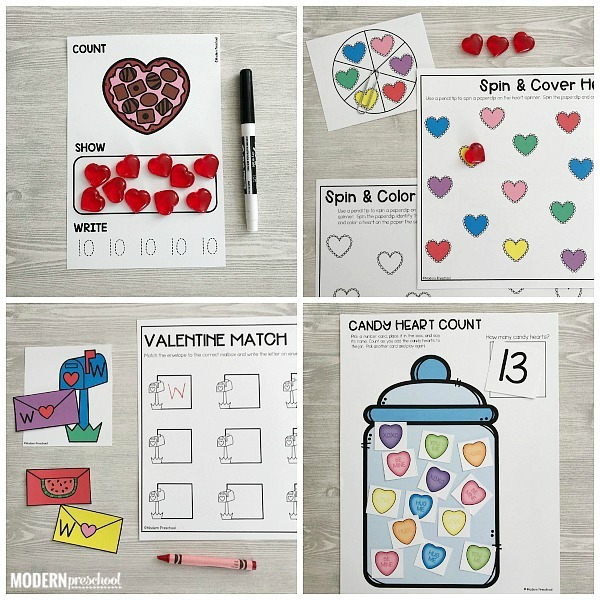 Candy Heart & Jar Count 1-20 – Pick a number and add the same amount of candy hearts to the jar counting mat. Use numbers 1-10 or all 1-20 depending on learning levels. 10 & 20 Frames Heart Match – Choose a 10 or 20 frame card, identify the number, and color in the matching number on the recording sheet. Three recording sheets are included: 1-10, 11-20, 1-20 to allow this activity to work with different learning levels. Count, Show, Write Chocolates 1-10 – Count the number of chocolates in the box of chocolates. Show the same number with manipulatives (plastic hearts, candy hearts, pom pom, buttons). Then trace the number at the bottom with dry erase markers. Addition & Subtraction Heart Cards – Count the number of hearts the first love bug and write the number in the first box. Count the hearts on the 2nd love bug and write it in the second box of the addition sentence. Then add (or count the total number) the numbers together and write the answer in the last box. Do the same for the subtraction cards. Count and write the total number, then count and write the hearts that are crossed out, and finally count and write the number of hearts left. 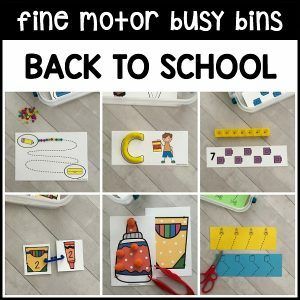 Use dry erase markers to make the activity reusable. Roll & Color Hearts to 50 or 100 – Choose the version that works best for your learners. Roll the die, identify the number of dots, and color in that same number of hearts on the recording sheet. Roll again and color in the next set of hearts until all hearts are colored in. Spin & Cover or Color Hearts – Use the tip of a pencil and a paperclip on the spinner. Spin and identify the heart color. Color in a heart the same color on the Spin & Color sheet OR cover a heart with the same color on the Spin & Cover sheet. A third optional Spin & Color sheet is included to stick to all black and white printing. 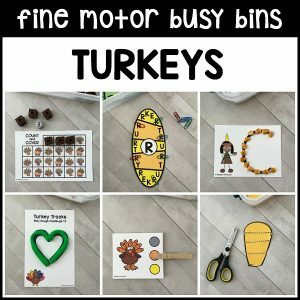 Now that you’re totally in love with our HEARTS Literacy & Math Centers, just wait until you see our HEARTS Fine Motor Busy Bins!